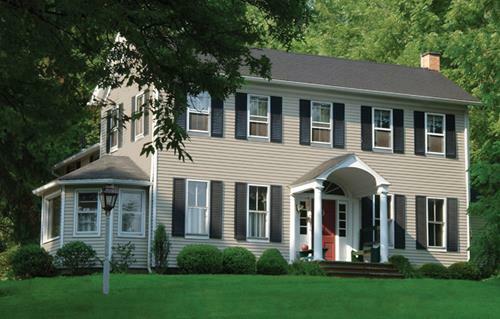 Vinyl siding is a beautiful and inexpensive option for your home to weatherproof it and offer it an elegant look. There are many advantages of choosing vinyl siding for your home, but you need to find a good contractor that will use quality materials and work with close attention to details. Gut-R-Dun is a company that can offer you professional exterior services in Kelowna and Vernon. We work only with the top suppliers in Canada to make sure that what we provide our clients with is pure excellence and quality. We are specialized in vinyl siding among other exterior services, and we are willing to go the extra mile for you. The benefits of vinyl siding are numerous. Firstly, you won’t have to pay an arm and a leg for it because this is an affordable option for your house that is both efficient and beautiful. Secondly, vinyl siding is available in many styles and colors so that you can customize the look of your house according to your tastes. We know how important customization is for you. After all, you are a unique individual, and you value quality as much as you value uniqueness. This siding option can satisfy your desires while offering you an affordable and high quality alternative to more expensive materials. When it comes to maintenance, we can safely say that vinyl siding is maintenance-free. It doesn’t need painting, and it naturally repels insects and rodents. All you have to do from time to time is wash it with a hose in case it gets muddy. It is also very resistant, and it doesn’t chip or rot like other materials. And if you are thinking about economy, you should know that vinyl siding lowers your cooling and heating bills by improving the energy efficiency of your house. And, of course, vinyl siding is a beautiful and elegant option for any home, offering you fantastic diversity. Whether you are building a new house, or you want to refresh the look of your existing one, this siding option is one of the best you have. It lasts ten times longer than wood siding, and it resists extreme weather, so you don’t have to worry about it. Gut-R-Dun is the company you want to work with if you are looking to explore the universe of vinyl siding. We offer professional services in Kelowna and Vernon, and we are aiming high. We use only top quality materials; we are flexible, and we are driven by the desire to bring you complete satisfaction. For more information and to see what we can do for you, please visit our website where you will find everything you need to know about our services and contact information.